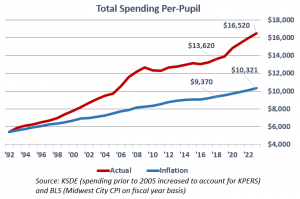 A recent Kansas City Star editorial said, “when adjusted for inflation, spending per-pupil in 2018, at $8,771, is right about where it was in the 1990s.” No explanation was provided for that obviously false claim, but it was attributed to a school lobbyist. 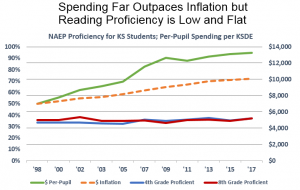 Data from the Kansas Department of Education (KSDE), however, says school funding was $13,620 per-pupil in 2018, which is far above long-term inflation. If 1992 funding of $5,461 per-pupil had been increased for inflation, it would only have been $9,370 last year, putting 2018 actual funding 45 percent above inflation. That’s just one of the falsehoods used to, ironically, accuse a gubernatorial candidate of lying about school funding. Senator Laura Kelly was quoted saying, “we have not been increasing funding for schools until this past year” but that’s not true. Department of Education data clearly shows funding increased six of the last seven years, and five of those years set new funding records, including 2018. The Star said, “Kobach is not right that we’ve been spending more and more on education, with nothing to show for it” but the facts show Koback is right. School funding increased dramatically over the last 20 years and achievement is basically flat. Kansas students have a lower ACT score now than in 1998, and less than 30 percent of those taking the ACT are considered college-ready in English, Reading, Math and Science. The chart below shows Reading proficiency on the National Assessment of Educational Progress went from 35 percent in 1998 to just 37 percent in 2017, while funding increased by $3.4 billion and was 35 percent above inflation. 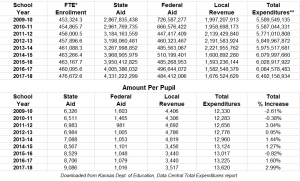 Perhaps repeating education lobbyists’ claim, the editorial said “…by some calculations…” more than 75 percent of funding goes to “the classroom.” KSDE has no official definition of ‘classroom.’ It defines ‘Instruction’ as direct interaction between students and teachers, and just 53.9 percent of spending went to Instruction in 2018. There’s general agreement that direct interaction between students and teachers brings the most benefit, and naturally, some parents are disturbed local school boards don’t allocate more money to Instruction (especially since the allocation has declined over the years). Instead of shifting more money to Instruction, school boards want to redefine the issue. There are two very different ways to measure efficiency. An input measurement focuses on getting the best possible price for the same or better-quality product or service, whereas an output measurement compares spending to some form of achievement. The cost study is clearly citing an output measurement, based on the authors’ absurd contention that performance on ACT exams, NAEP or state assessment tests is limited or controlled by spending (the basis for ‘potential output’). There’s not a single case where spending more (or less) money caused student achievement to change but there are many examples of states spending less than Kansas and getting better results. As for whether school districts could operate more efficiently, every single government-run efficiency study has found Kansas school districts could save money without affecting quality. The Star clearly has a favorite in the race for Kansas governor, but it shouldn’t distort the truth for any candidate’s benefit. Kansas Policy Institute does not support or oppose candidates for public office, and this column should not be construed as favoring or opposing any candidate. 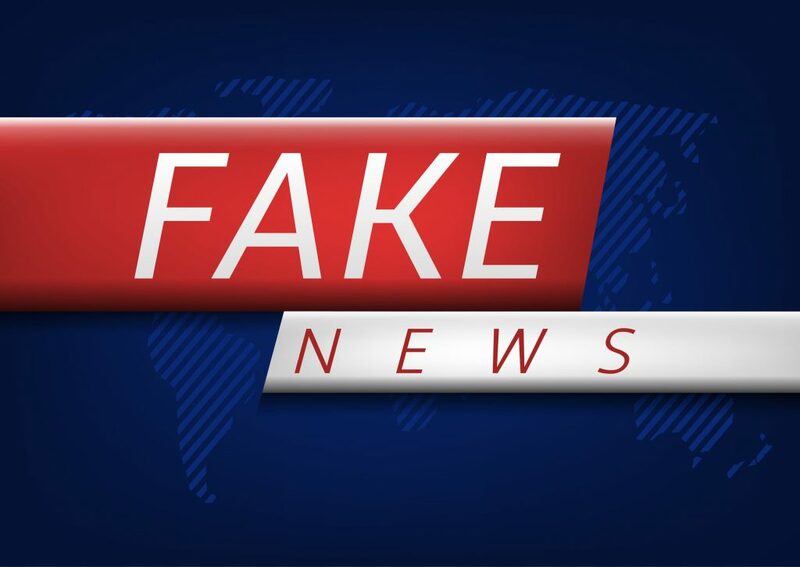 We provided the Star with documentation of the inaccuracies in their editorial almost two weeks ago and expressed our desire that they set the record straight. To date, they’ve declined to publish a correction so we do so here.